This creative person was born in Mexico in 1907. With all her tragic biography, she was a cheerful and cheerful woman with her own mystery and dream of a new future. It was this that allowed her, in writing pictures, to convey all of her mental anguish and pain, tears and the loss of the incomprehensible, and much more that bound her fate. At the same time in the works of Calo can be traced not only the influence of folk Mexican culture and art, but also European painting. The style of naivety and simplicity, one might say, somewhere rudeness is emphasized in her paintings. 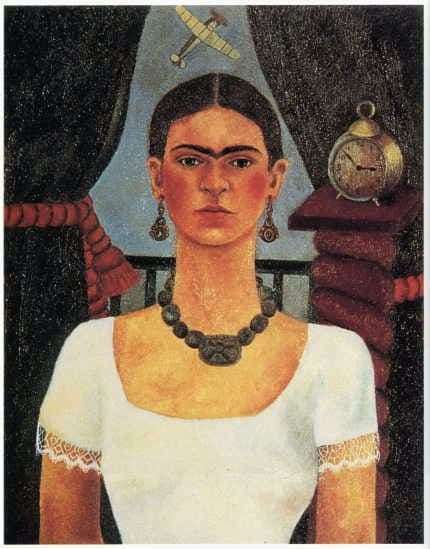 Most of her works are dedicated to her, as Frida spent a long time alone. Because of a car accident, she was bedridden and wrote pictures lying down. It was this event that turned her whole life. But on no self-portrait, Frida does not feel joy and does not smile. She is always serious. Accrete eyebrows, barely noticeable antennae over lips, which are constantly tightly compressed. Black, beautiful and long hair is always neatly tucked behind the head in a bun or loose along the shoulders. Face and neck open. The severity and strength of character is felt in her self-portrait. The long and beautiful neck is sometimes framed by a necklace. The shoulders are straightened, the head is raised, the back is even, it gives the impression of a beautiful and proud posture. The color spectrum of self-portraits makes the viewer think, since it is mostly gray, from darkish tones. It rather emphasizes both the severity, and not quite, perhaps, the healthy or painfully sad mood of the heroine. What can she be sad about? About the failed attempt to become a mother, and maybe about life is not so easy. But, despite such a difficult fate, Frida left behind a large legacy, about 200 paintings, not including sketches.